Television and mental-health activist Ed Asner is the keynote speaker at Limmud AZ. Photo courtesy of the Ed Asner website. A large crowd assembles at Limmud AZ 2018. Asner’s speech marks the first time Limmud AZ, a daylong celebration of Jewish learning, has had a keynote speaker. In the past, guests went directly to one of the dozens of offered classes that interested them. 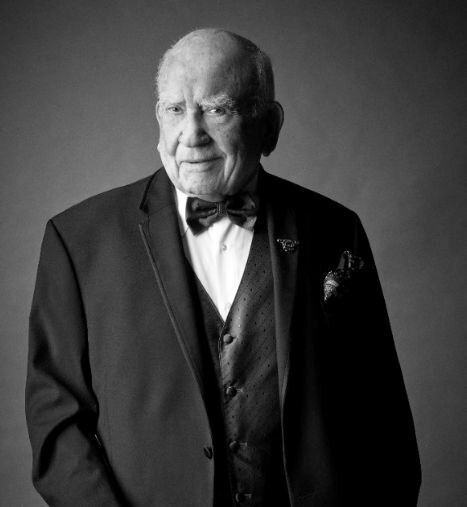 There will be no classes taking place during Asner’s presentation. This is the fifth year Arizona has held an official Limmud event, which will take place at Arizona State University’s Conference Center at the Memorial Union on the Tempe Campus. There are Limmud events all around the country, each with the core value of expanding Jewish horizons, enabling connections, participation, learning and empowerment. Limmud began as a movement in 1980 in England. Here in Arizona, Limmud is organized and run by a large group of dedicated volunteers. Amanda Walker, the event’s facilities manager, expects more than 400 people to attend this year’s Limmud AZ — and they’ll have a lot to choose from. Each hour of the event will feature approximately 12 different presenters. That’s exactly what the event's co-founders — Sandy Adler, Rabbi Elana Kanter of the New Shul and Suzanne Swift — wanted for Arizona’s Jewish community after they learned about Limmud in England. This is Null’s first year as a Limmud volunteer. She is part of the publicity/communications and marketing team. Null got involved because she was looking for a way to volunteer her time and talents in a way that allowed others to acquire knowledge. She said the core values of Limmud aligned with her personal philosophy of helping others find a sense of belonging through learning. But as a fan of “The Mary Tyler-Moore Show,” a popular and groundbreaking TV program in the ’70s, Walker is most excited to see Ed Asner, who starred as the lovable and irascible Lou Grant, Mary’s boss. Asner, who was raised in an Orthodox Jewish household in Kansas City, Missouri, will speak to Limmud attendees from his perspective as namesake of the Ed Asner Family Center, which was founded last year. He’ll be joined by his son, Matthew Asner, and his daughter-in law, Navah Paskowitz-Asner, who are co-founders of the Family Center. Though the center is still in the beginning stages of its development, it is gearing up for programming dedicated to enhancing self-esteem in people with special needs. It will offer a variety of mental health programs and support groups, along with educational courses on topics like resume-building and fine arts. Asner, who is a longtime activist on a host of issues, from wildlife conservation to Holocaust remembrance, is both a parent and a grandparent of a child with autism. Along with Matt and Navah, he is deeply involved with autism-focused nonprofits such as Autism Speaks. Gesher Disability Resources will feature Asner and his children at a luncheon the Friday before Limmud AZ on Feb. 8 at the Ina Levine JCC. After Asner’s keynote address at Limmud AZ, attendees will be able to learn from speakers and lecturers from across the Valley and state, including Sedona and Tucson. For more information about the event, please go to limmudaz.org.